Happy 4th of July to all of you in America (and not in America)! 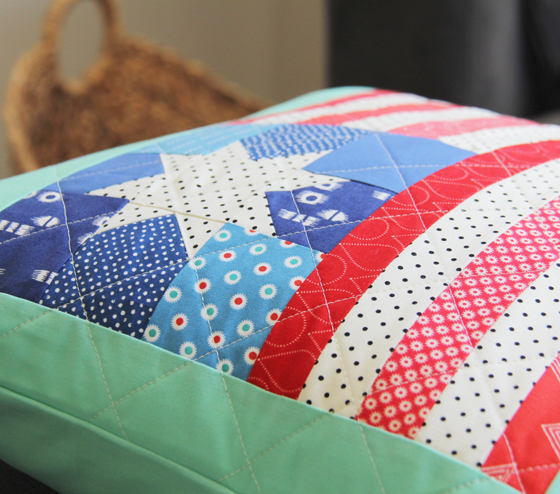 As you can see I turned my flag block into a pillow…it’s very festive. I had lots of requests for instructions so they are below. On the real flag there is a white strip under the blue…but I liked this layout so there ya go. There are lots of possibilities! 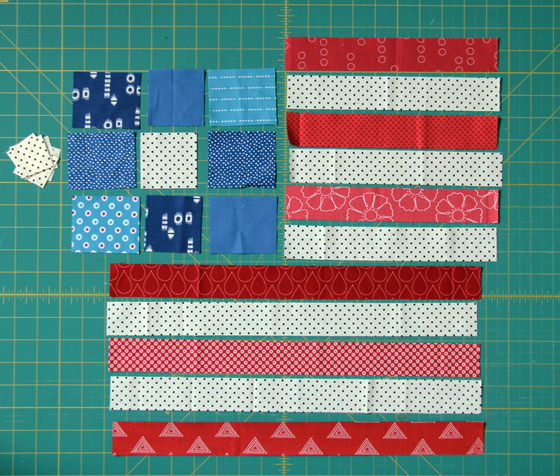 Layout the blue pieces with the 2 1/2″ squares in the top center and bottom center, and the 2 1/2″ sides all facing the center. 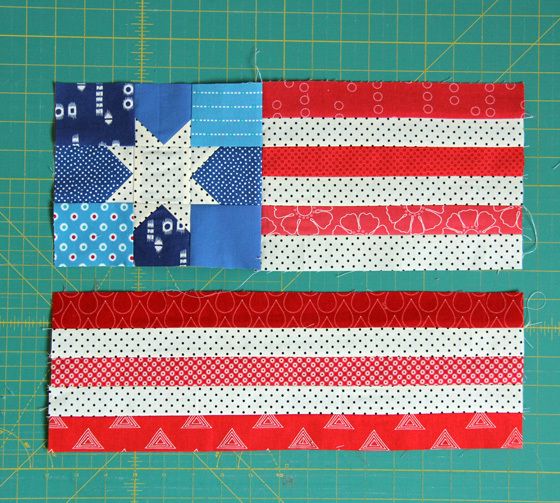 Make a star block…here is a step by step on making the star units. 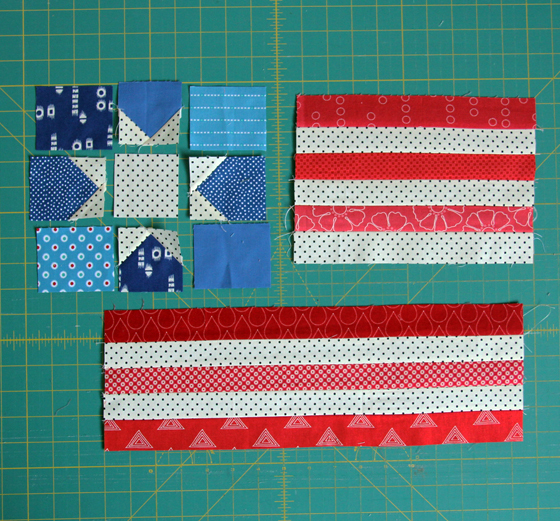 Layout and sew your strips into sets as shown. 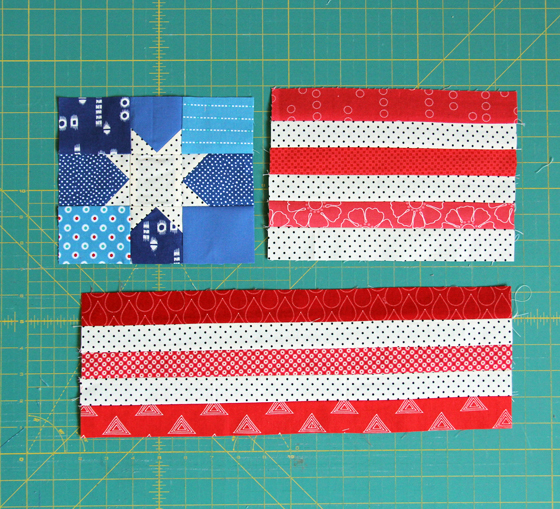 Sew the star together, then sew it to the 9 1/2″ strip set. Press, then sew the top to the bottom strip set. Done! 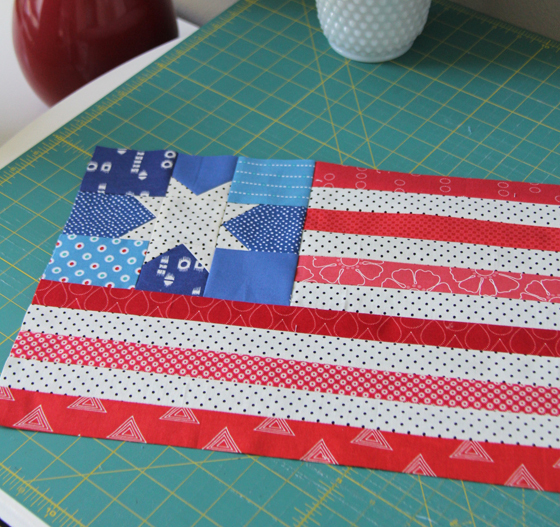 Megan already whipped up a super cute flag block here and made it into a mini quilt! She’s so speedy. Great block!! Love the pillow you made! Great pillow. Happy 4th of July. Thank you for this tutorial! Love it! Super cute! Thank you for sharing it! Greetings for 4th July from across the pond. I whipped this up as a small gift for friends who are hosting an American Supper tonight. Great pattern and very quickly put together, so many thanks. I did find that I needed a white 2 1/2" square for the middle of the star, though. Thanks for the instructions! Love this! Happy 4th. What a great pillow! I am not American, but I am totally in love with this. 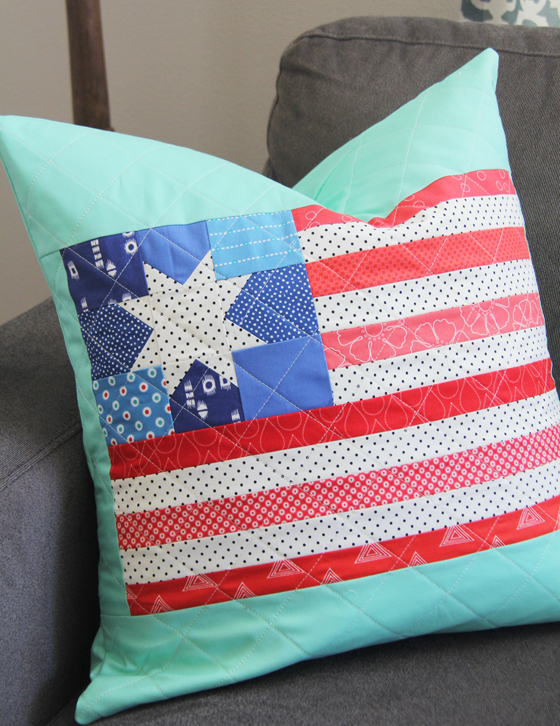 Patriotic in a quilty way! Enjoy you 4th of July. DARLING! Thank you for sharing & giving! Happy 4th to you & your cute family! Oh Allison! It's so cute! May I use it as my Profile Pic Today if Igive The Cluck Cluck Sew blog address? Just asking….its up to you, my dear! -Carol in Pure Michigan. Of course Carol! Cute idea! The 2 1/2" white square has been added…can't believe I forgot that! Thanks for the tut! Love it! Happy 4th! Thanks so much for the pattern! Thank you for this, Allison! I love it. :-) Love the aqua you used on your pillow. Oh this is too cute. Lucy would like this!! I might have to make this! Happy 4th of July! That pillow is so fun, and pretty! I made 2 of these last weekend. I love them. May be my favorite project to date. One for my daughter and one for me!